This term's focus is: "The weather in my world". Room 24 students drew themselves on a typical spring day doing a sporting event (ready for next week's Sports Day). 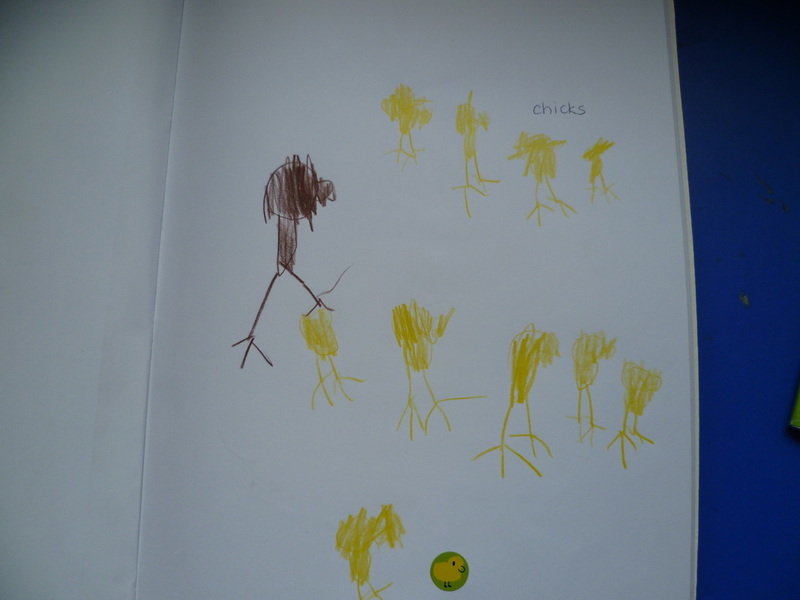 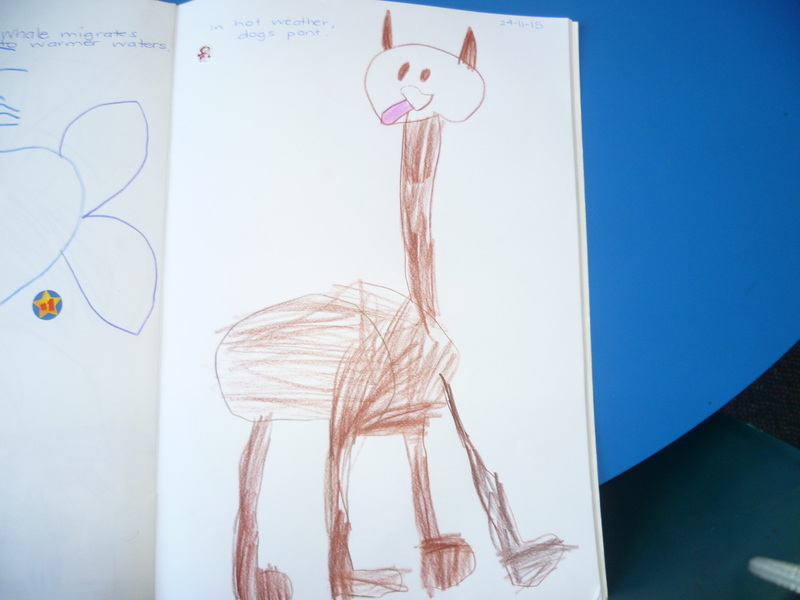 Week 3: The Reception classes explored what animals do to avoid the cold weather. 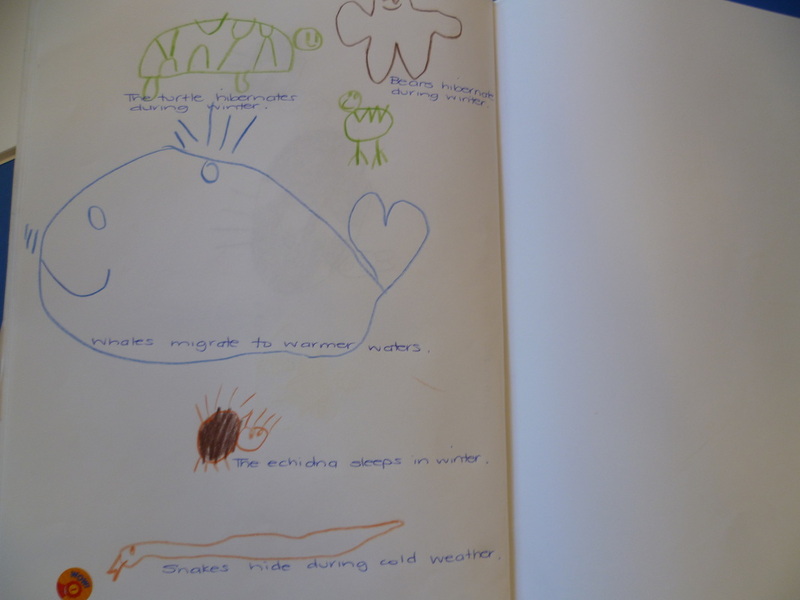 Some animals, like whales and some birds, migrate to warmer places. Some animals, like bears and long-neck turtles, hibernate during winter months. 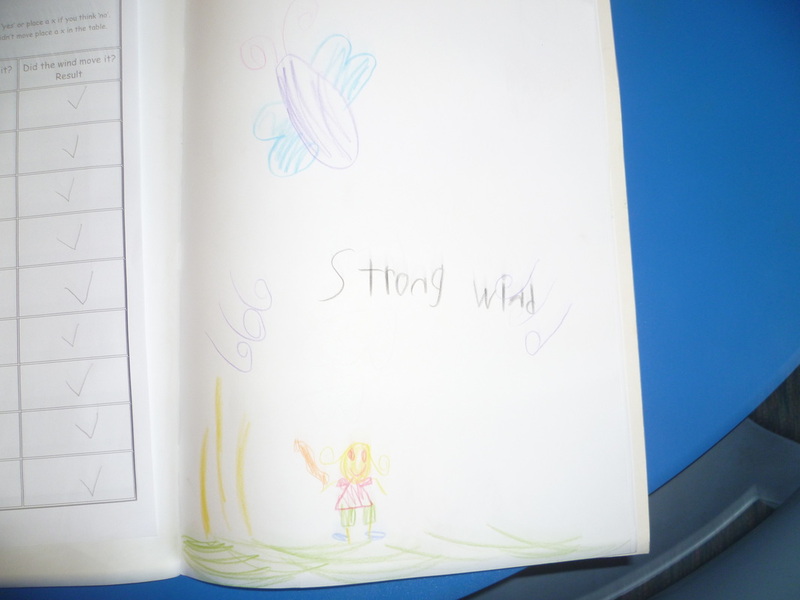 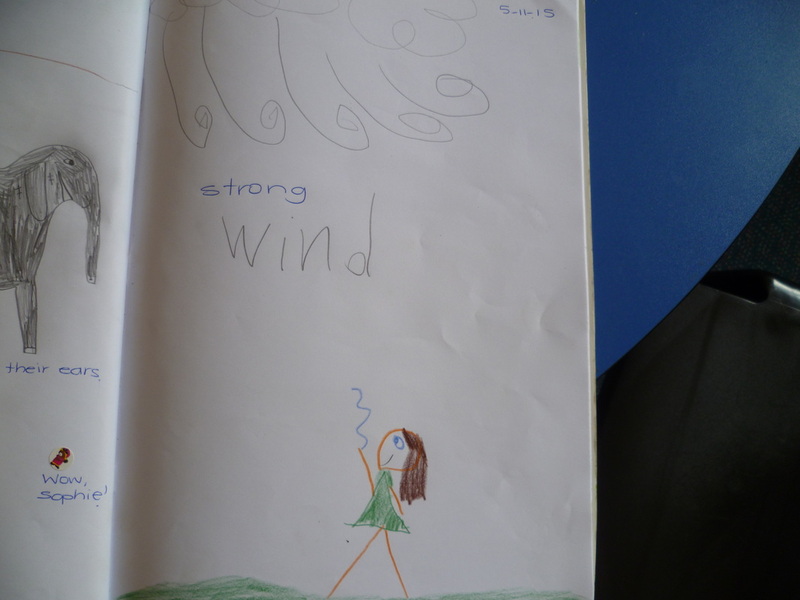 Week 4: The Reception students explored wind. 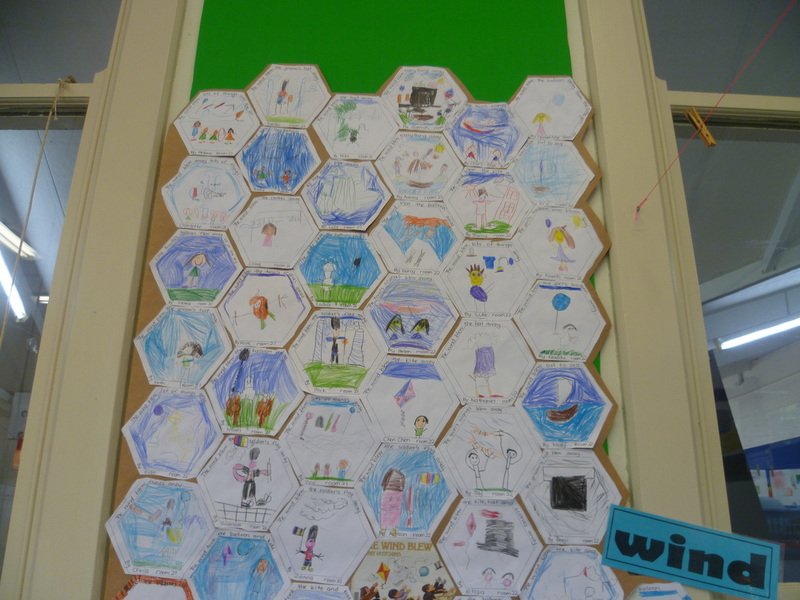 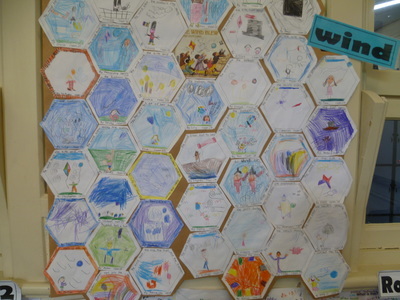 We read the book "The Wind Blew" and then each student drew a scene from it to create a picture quilt. 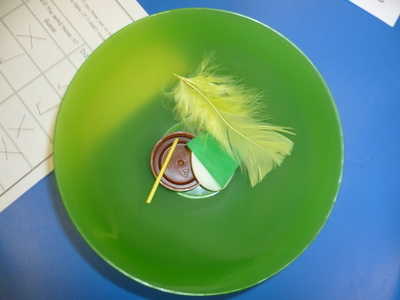 The students then paired up (speaker and manager) and experimented if certain objects (eg. feather, lid, matchstick, cardboard, tissue paper, marble) could move from wind. 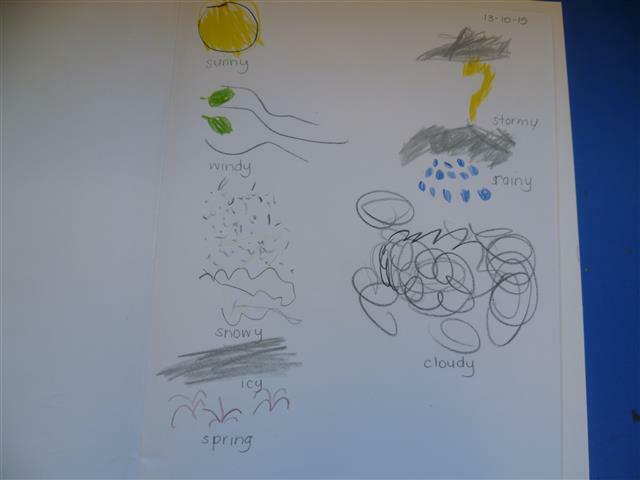 Week 5: The Reception students explored clouds. They checked out the cloudy days on the weather website; watched a part of a DVD about clouds; and reader a book about clouds. With this information they created a cloudy scene using cotton wool for the clouds. 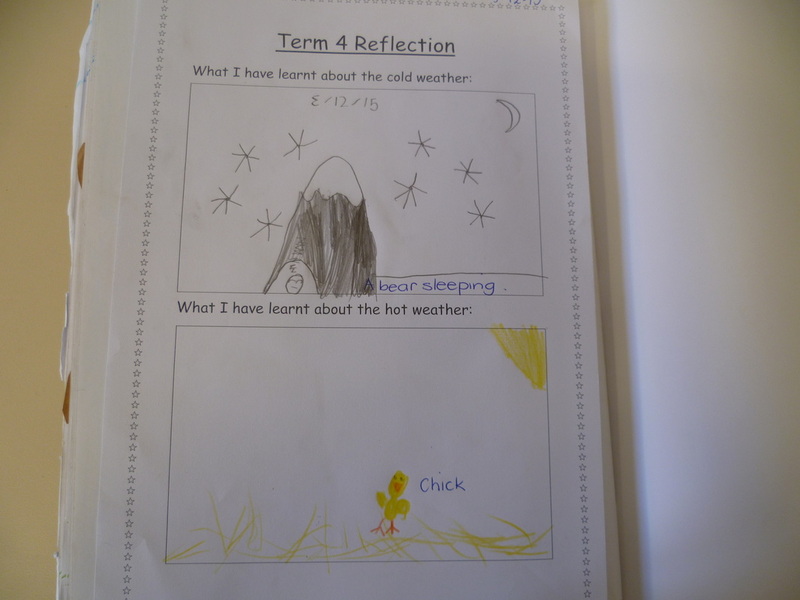 Week 6: The Reception students investigated how hot weather affects animals. How do they keep themselves cool? 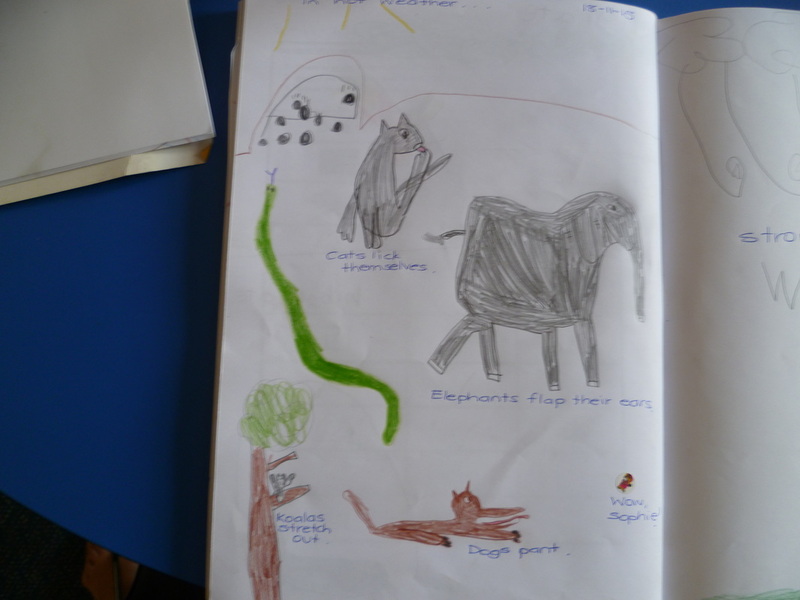 Dogs pant and moult; kangaroos, wallabies and cats lick themselves; elephants flap their ears and spray water on themselves; snakes prefer warm weather but hide when it is really hot; and koalas stretch out. 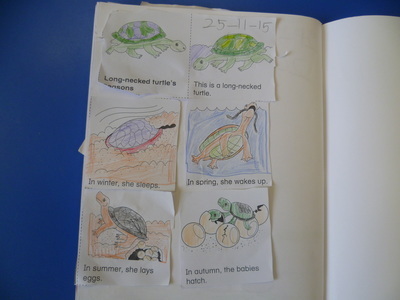 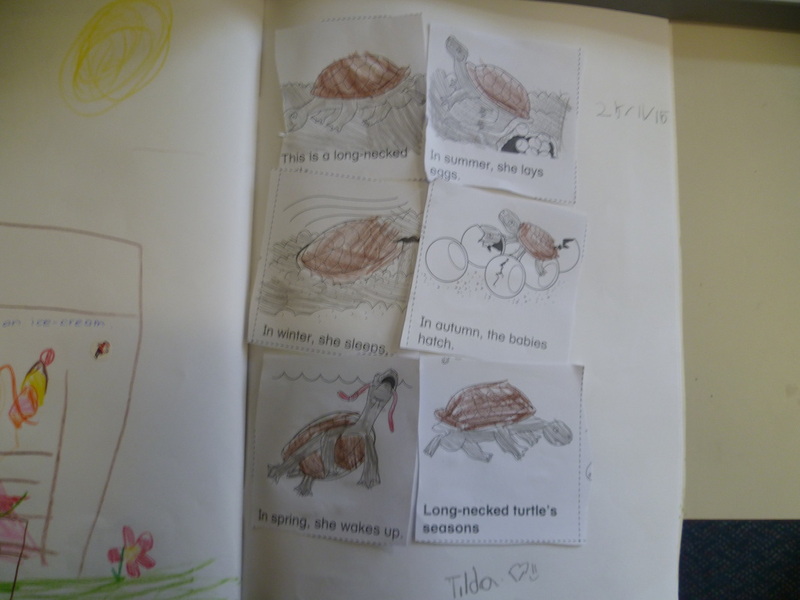 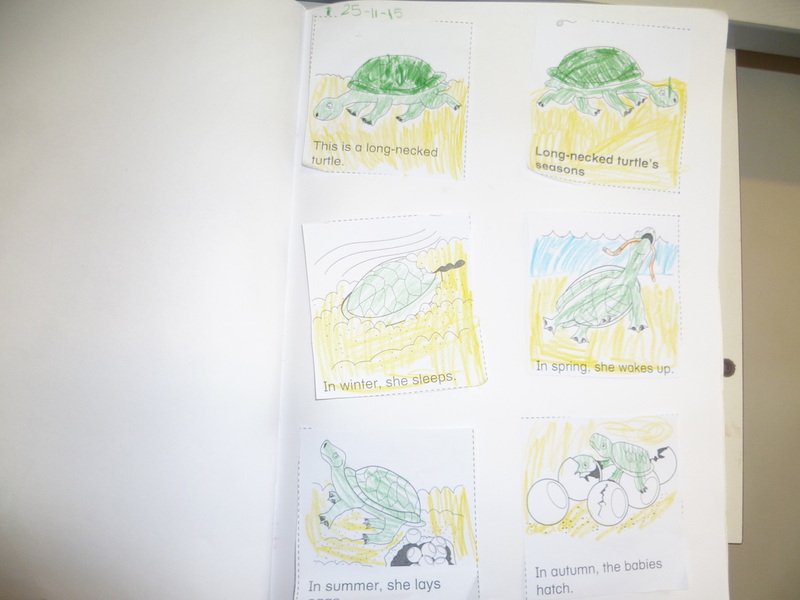 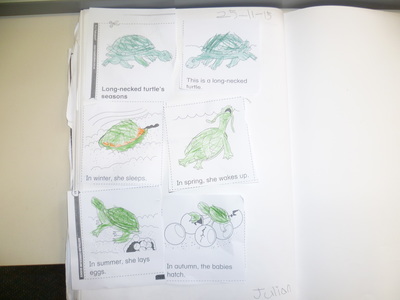 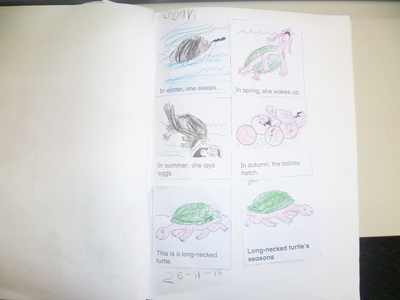 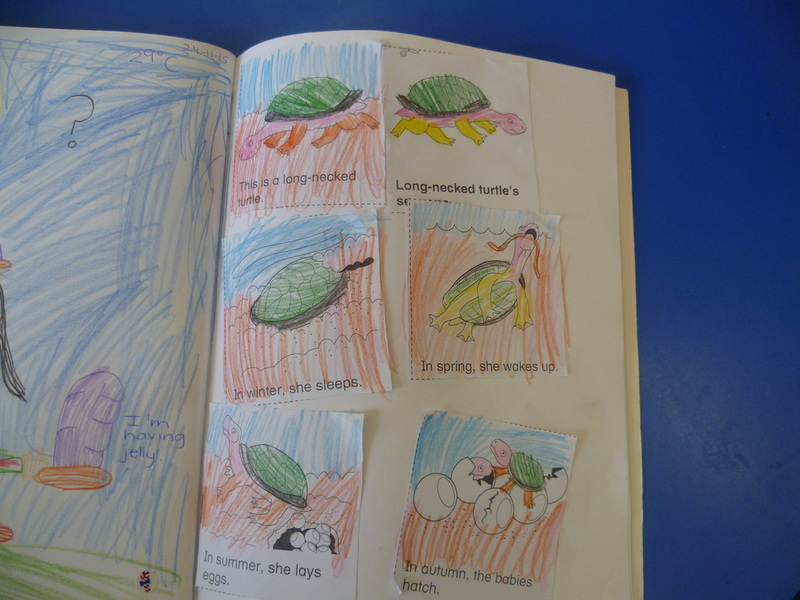 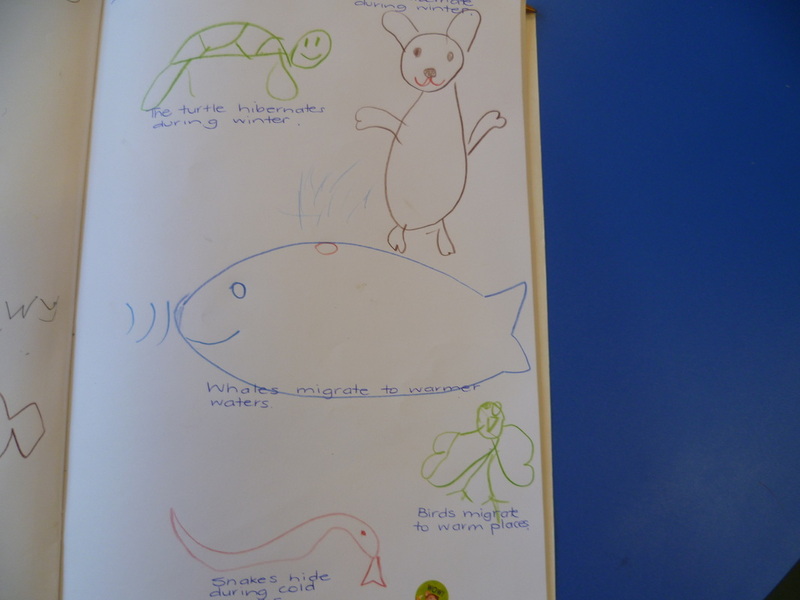 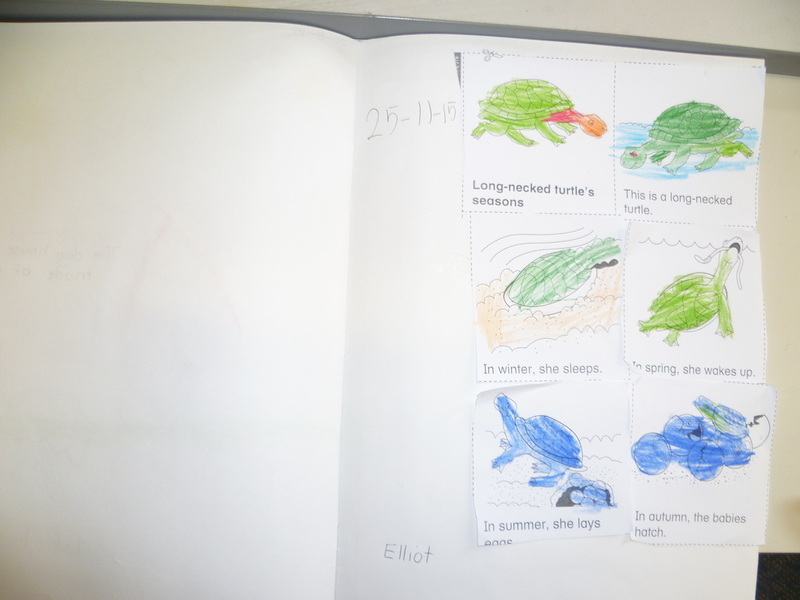 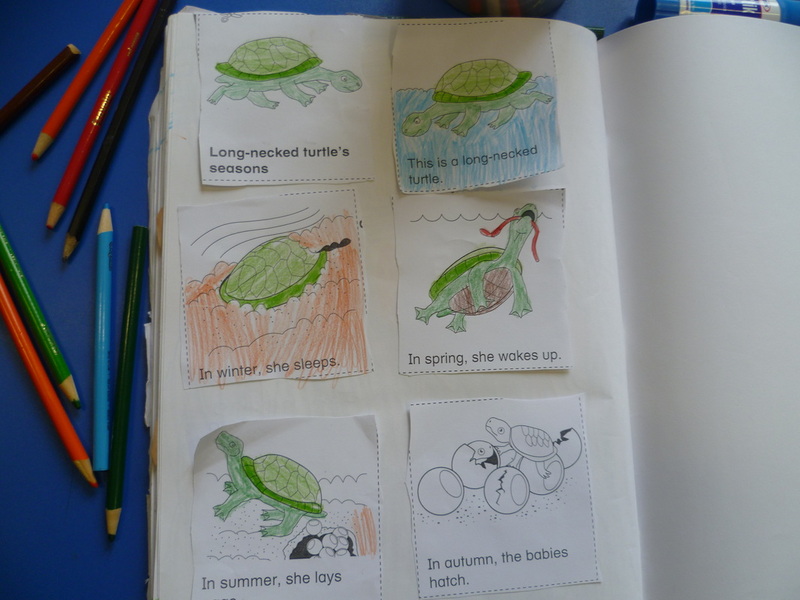 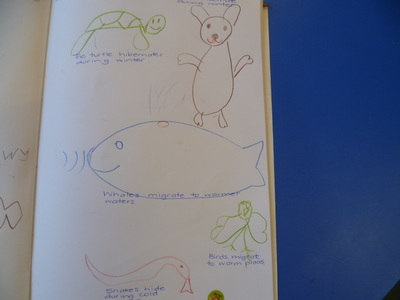 Week 7: The Reception students had a close look at the life cycle of the Long-necked turtle. It sleeps (hibernates) in winter; wakes up in spring; lays eggs in summer; and the babies hatch in autumn. 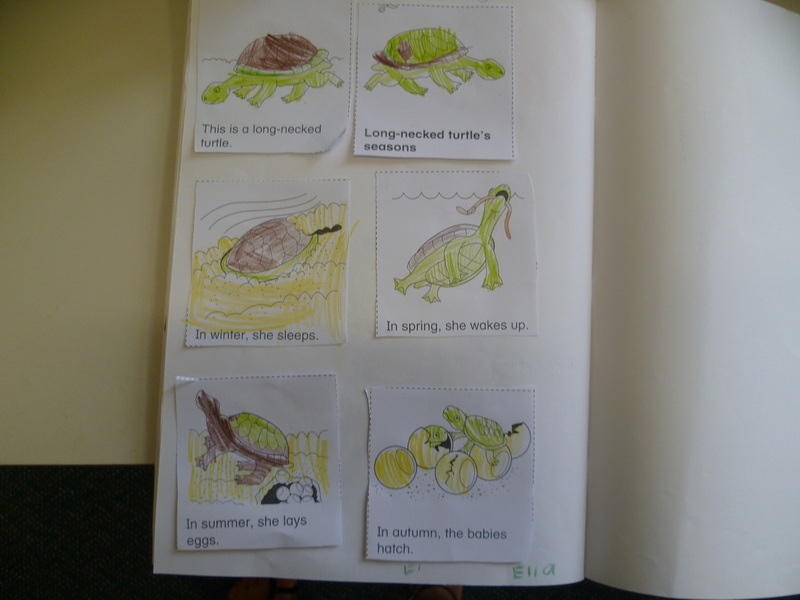 Students had to colour , cut and place this sequence in order. 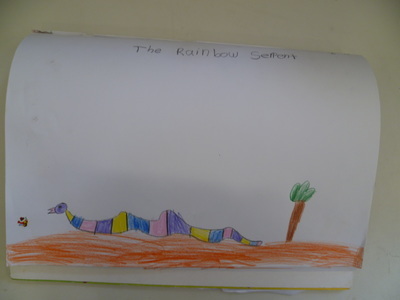 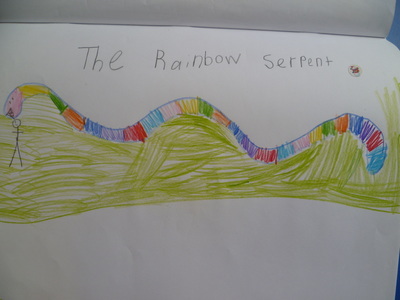 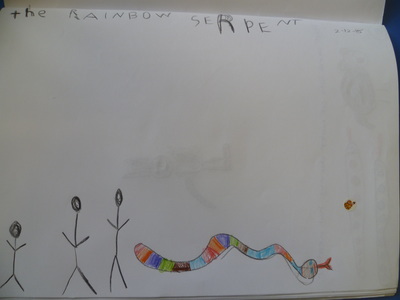 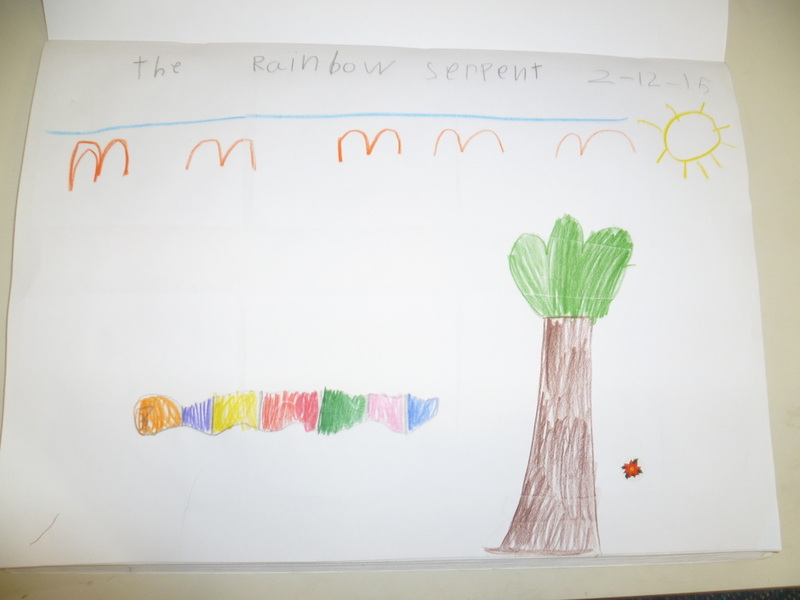 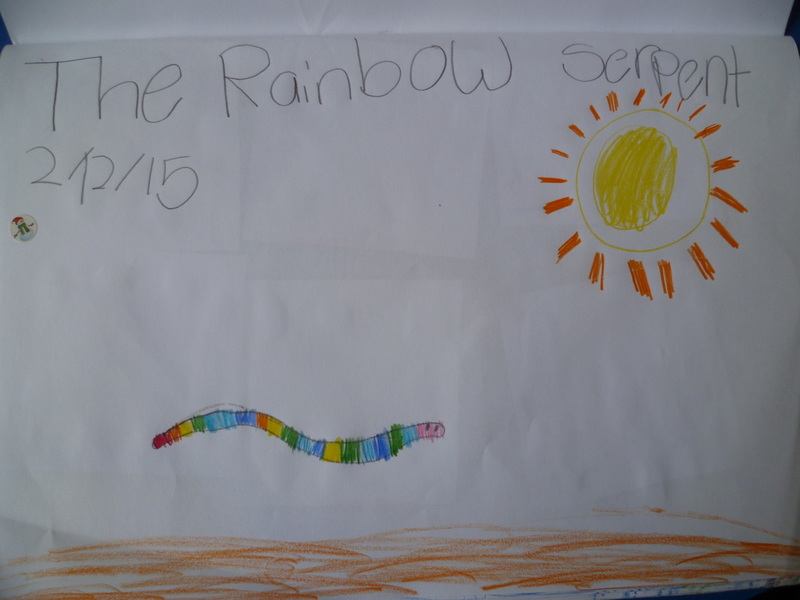 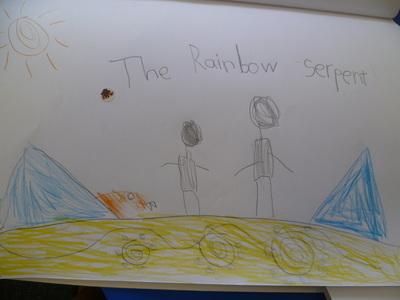 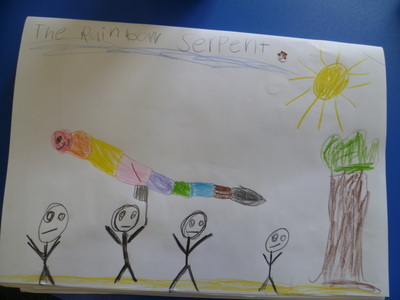 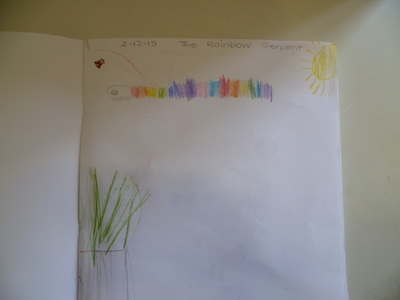 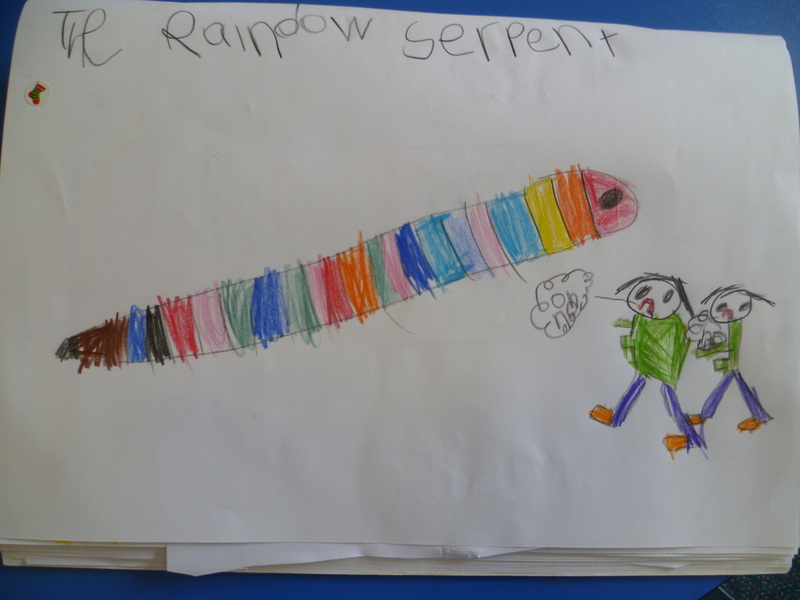 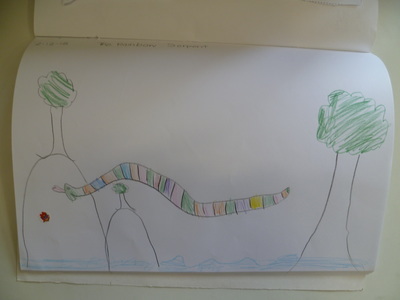 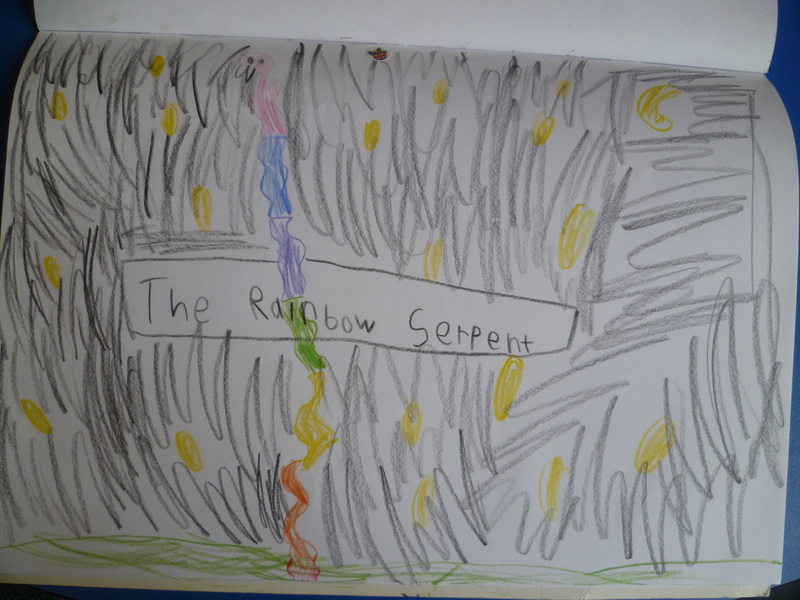 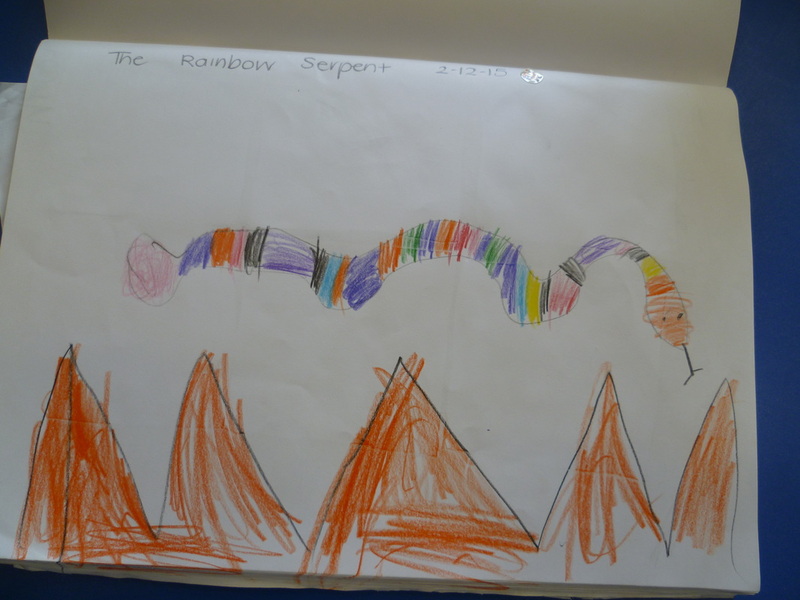 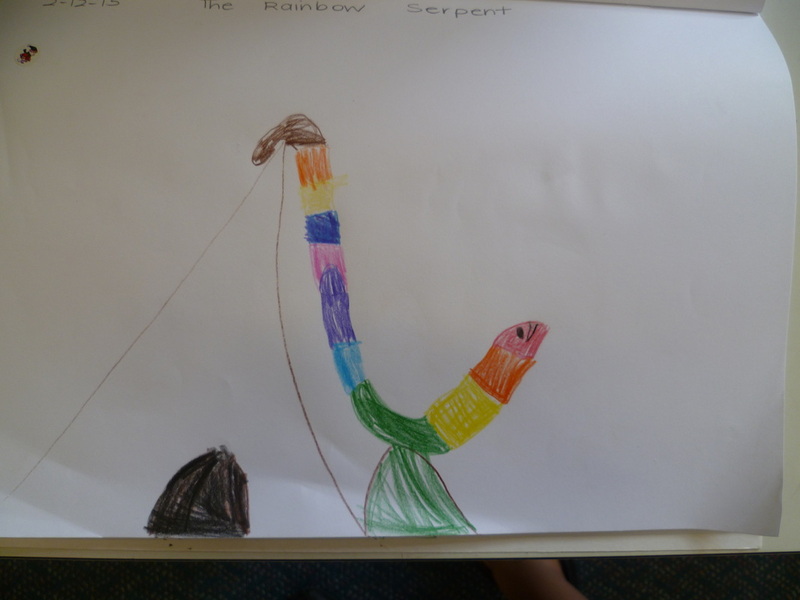 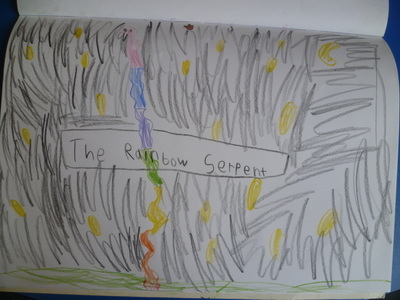 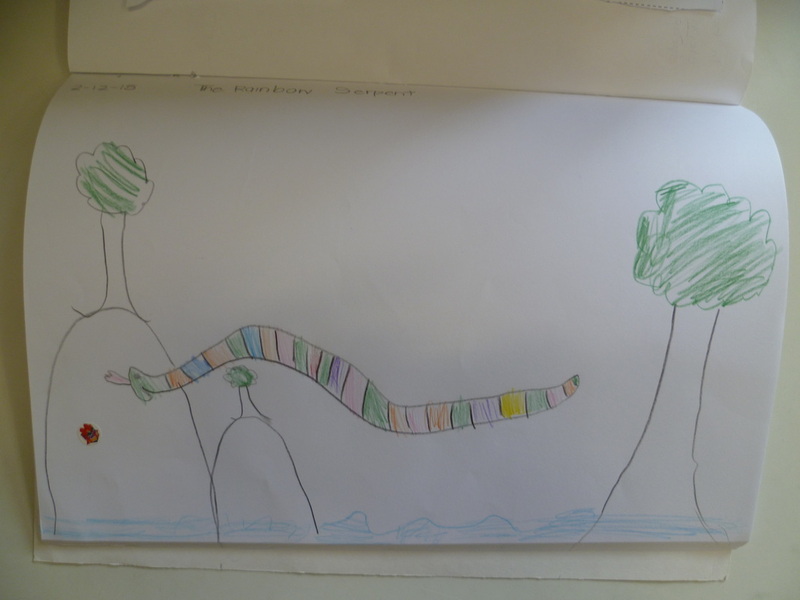 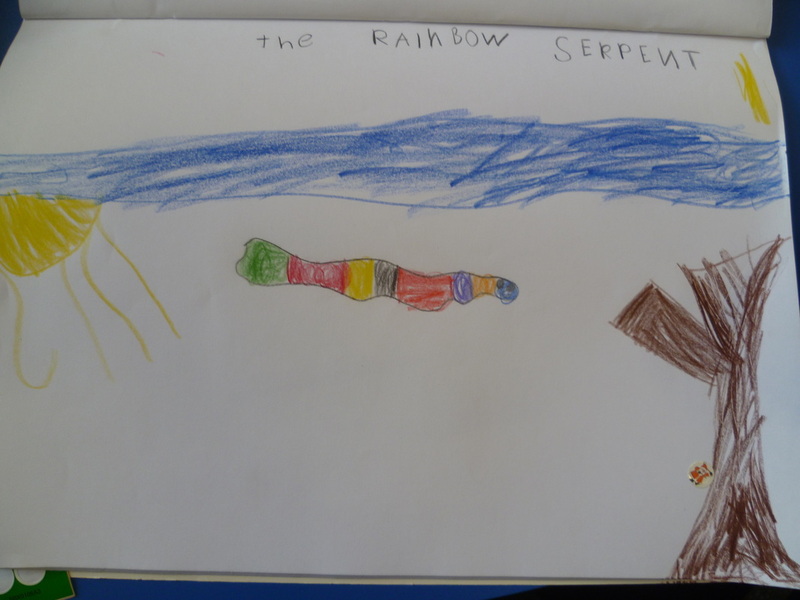 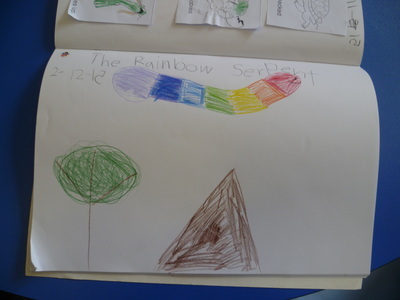 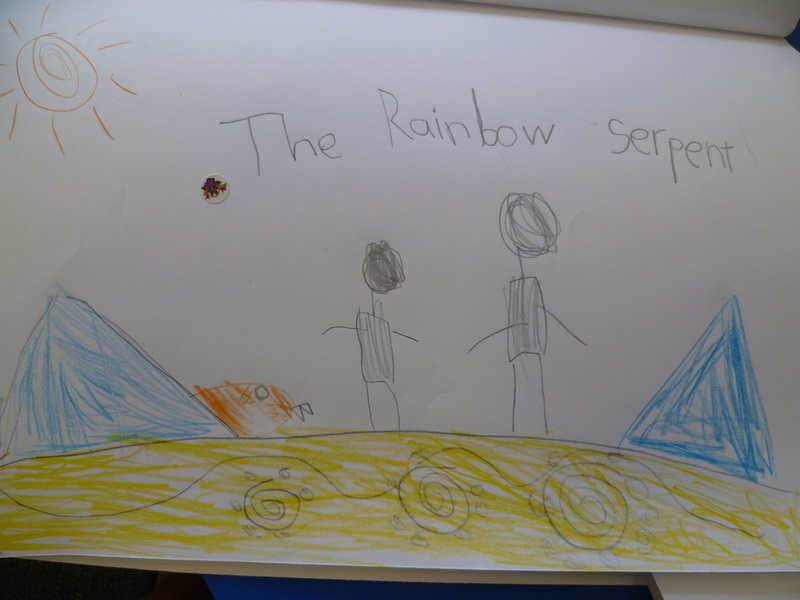 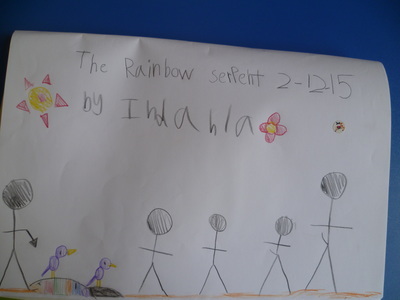 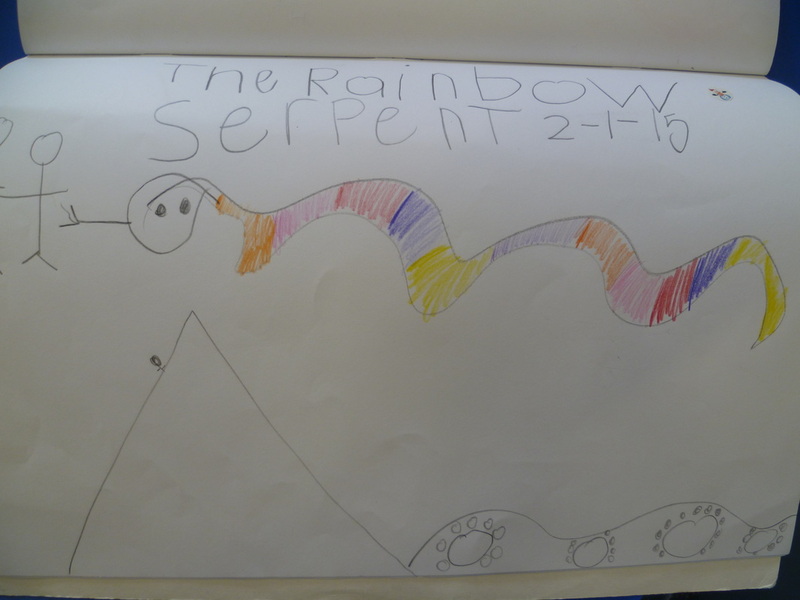 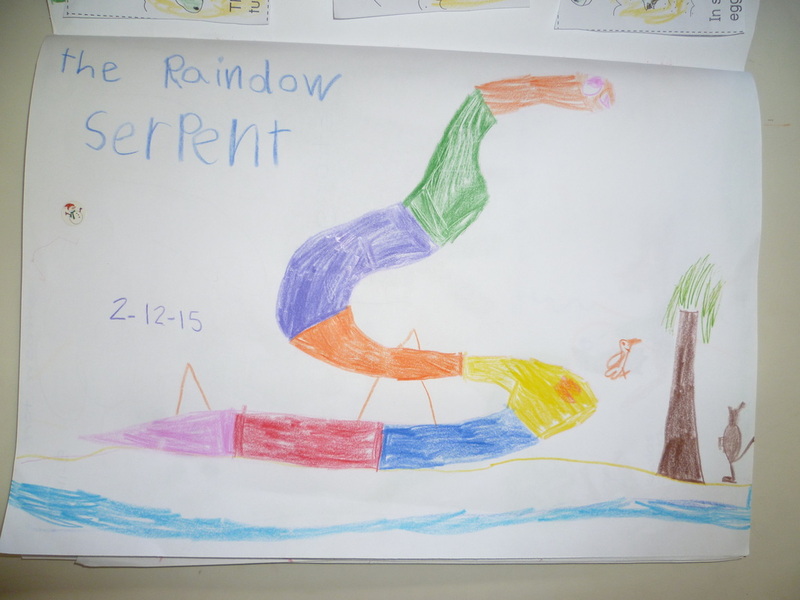 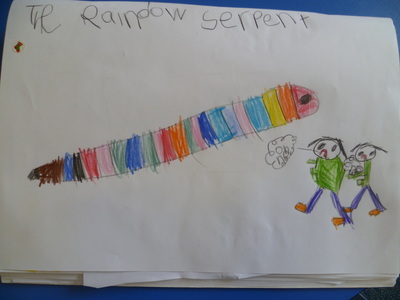 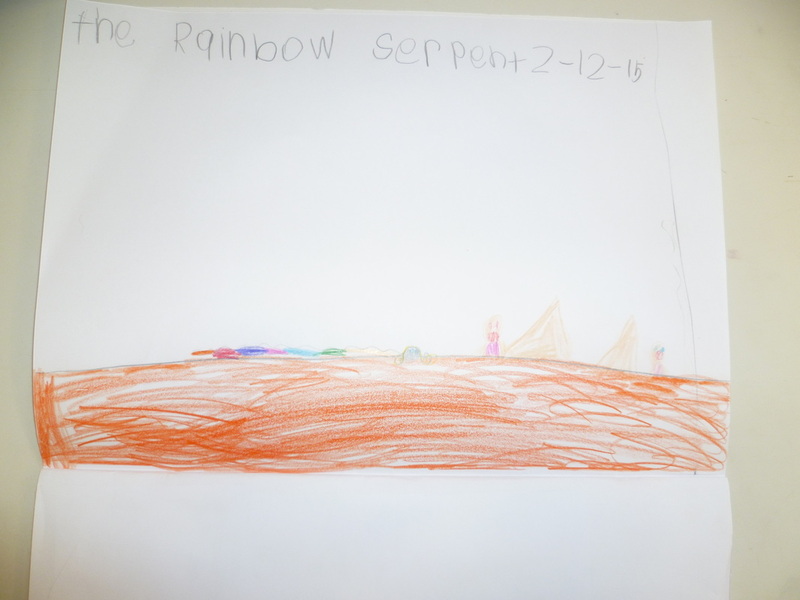 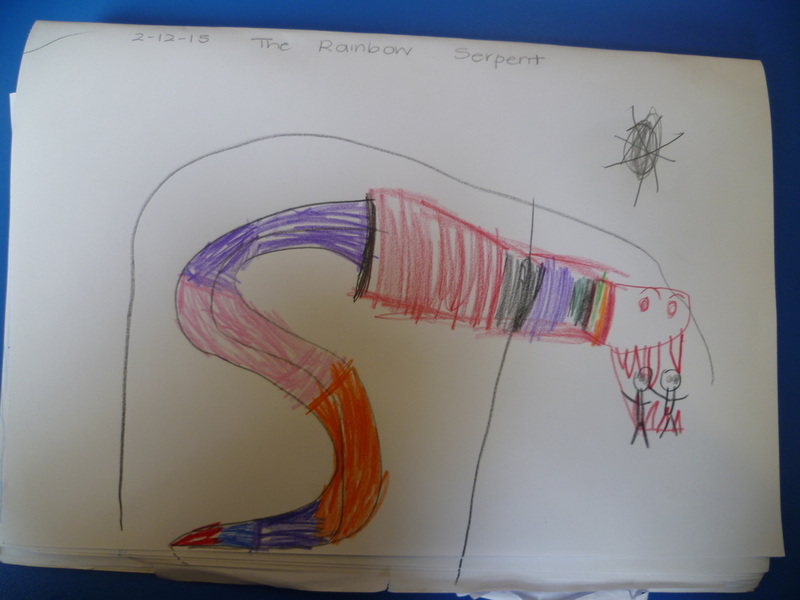 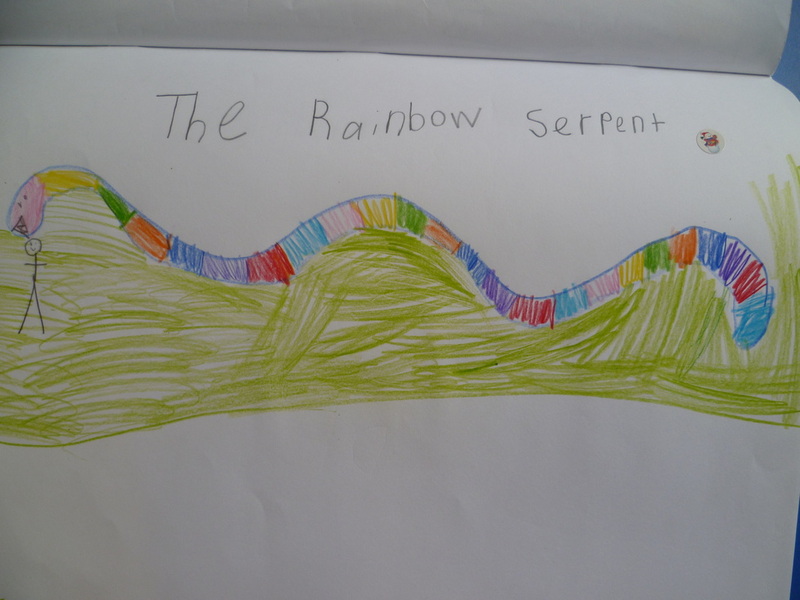 Week 8: The Reception students watched the The Dreaming Story "The Rainbow Serpent". They then recorded their ideas in their books and then created a mobile of the serpent. 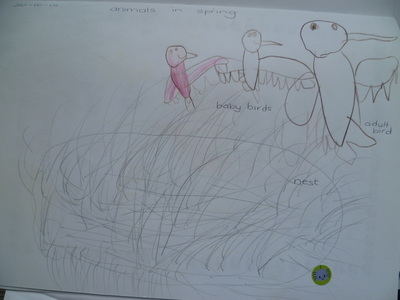 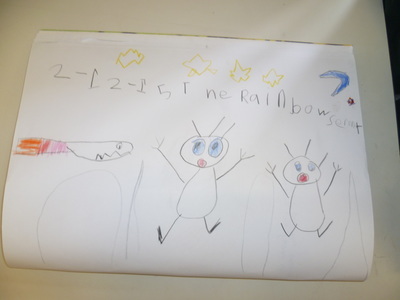 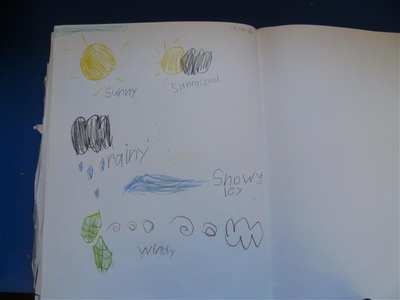 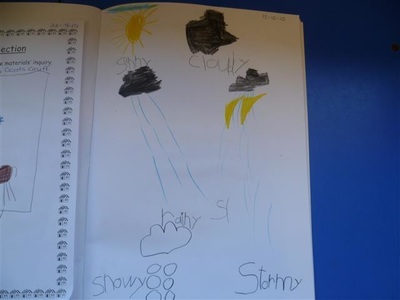 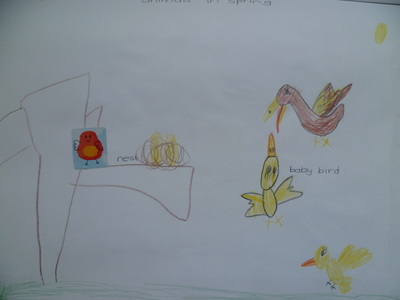 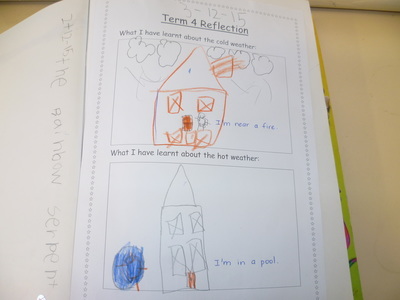 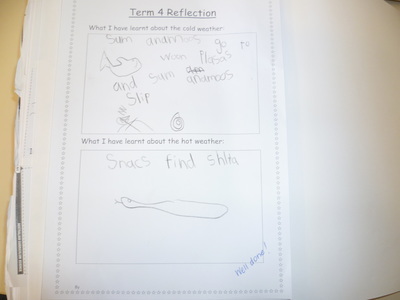 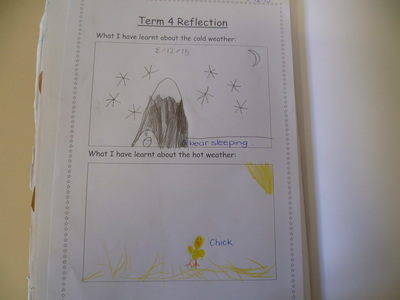 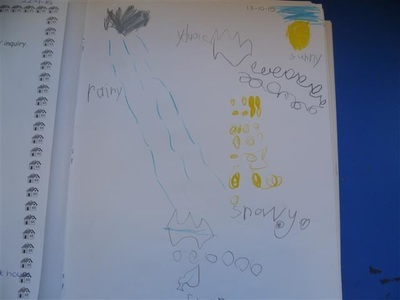 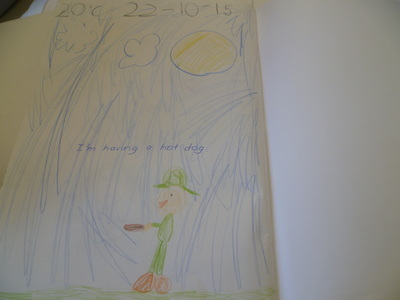 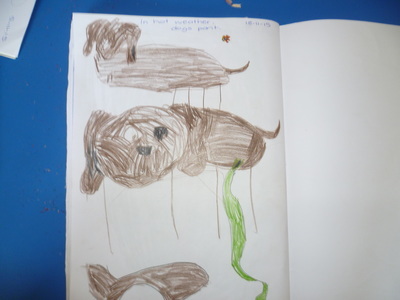 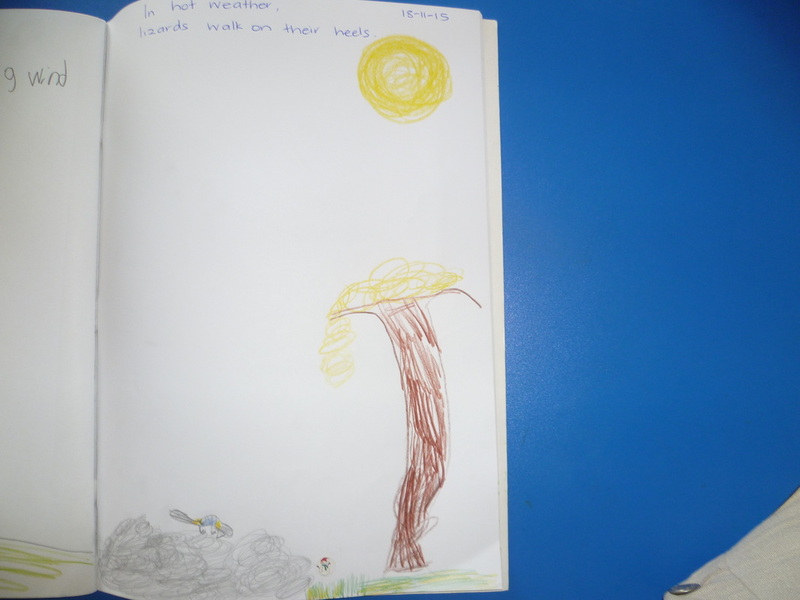 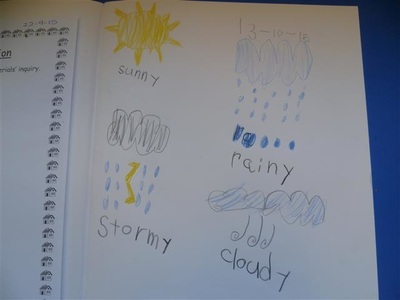 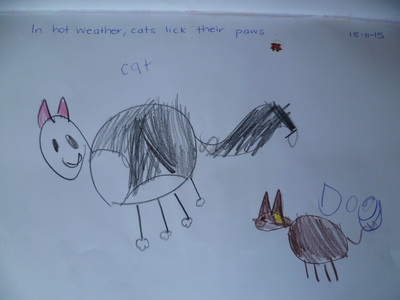 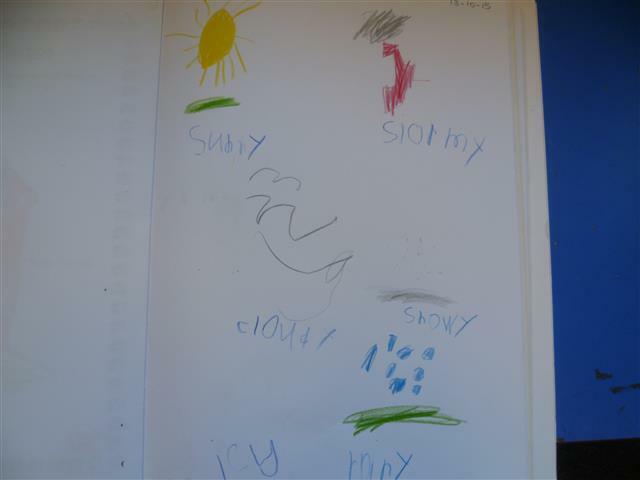 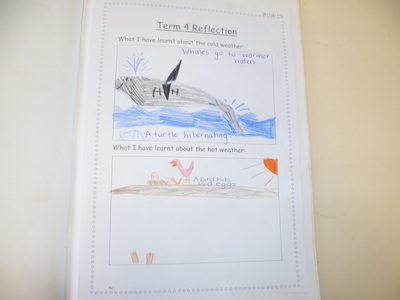 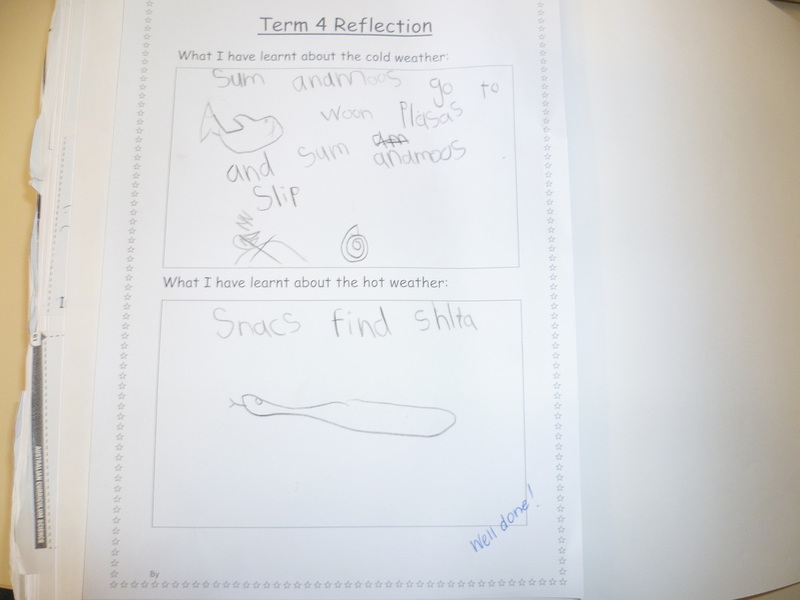 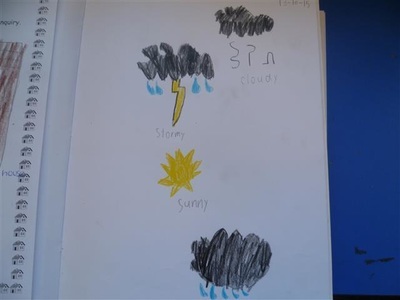 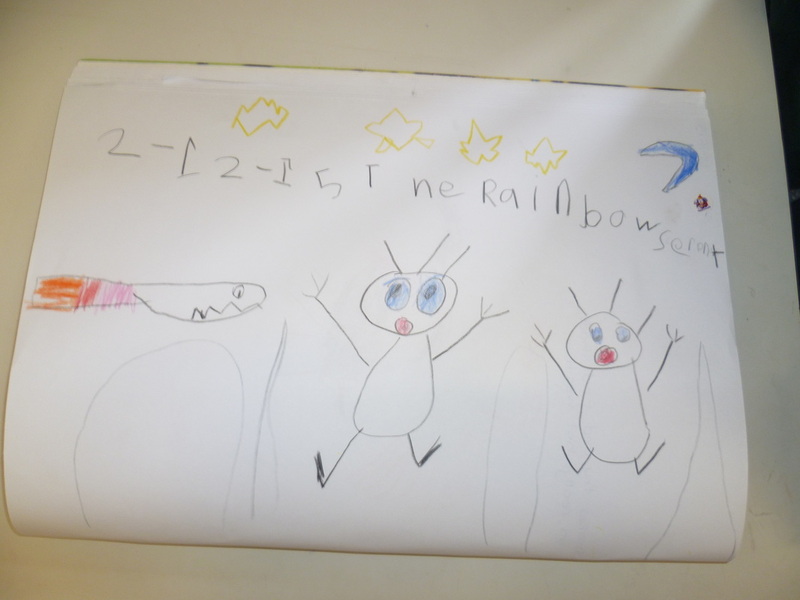 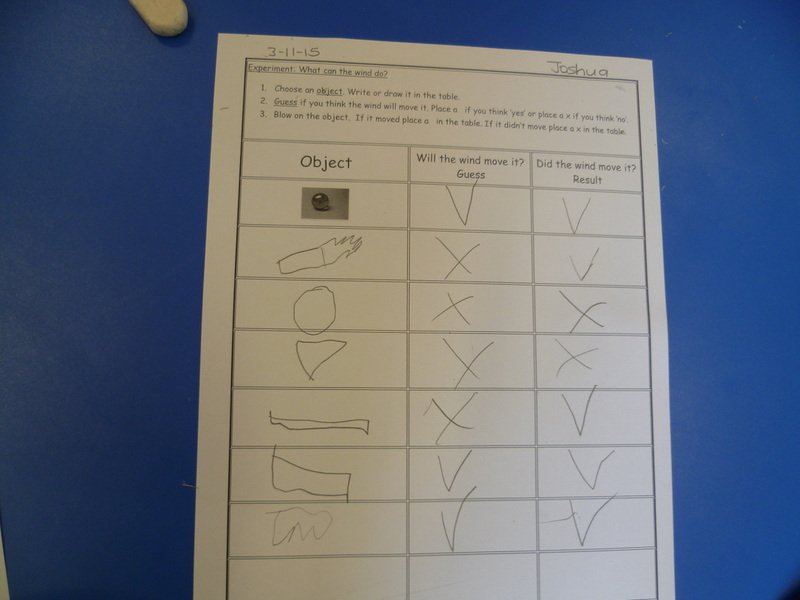 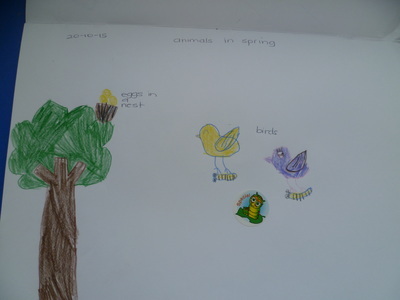 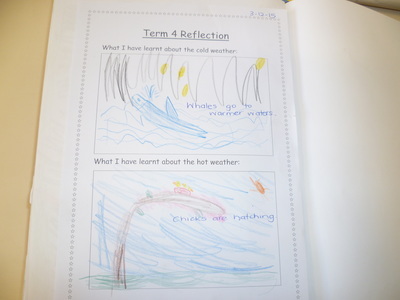 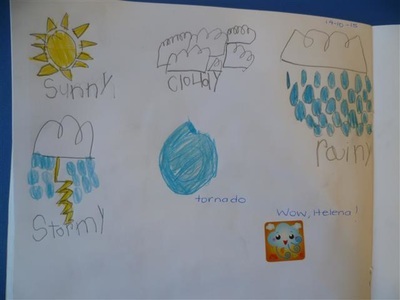 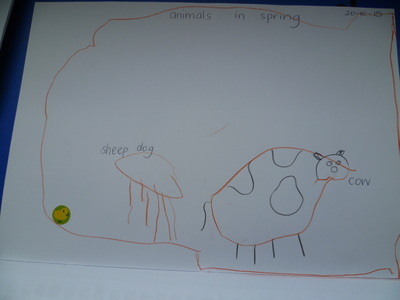 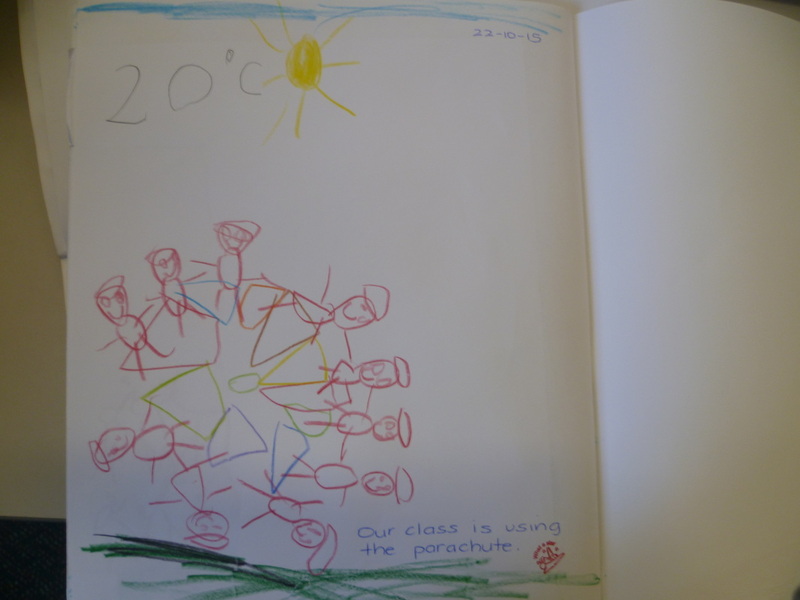 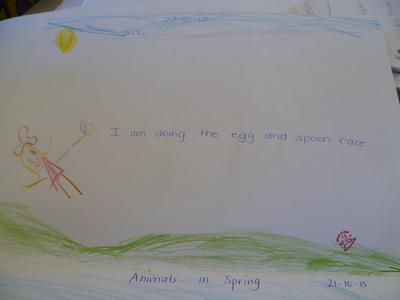 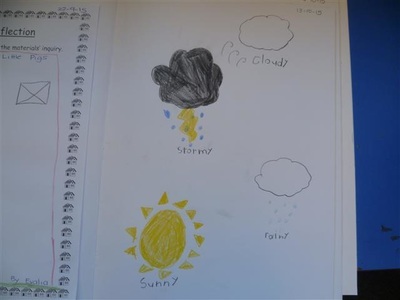 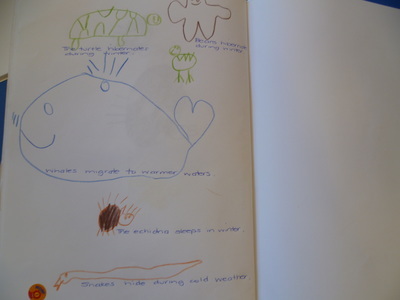 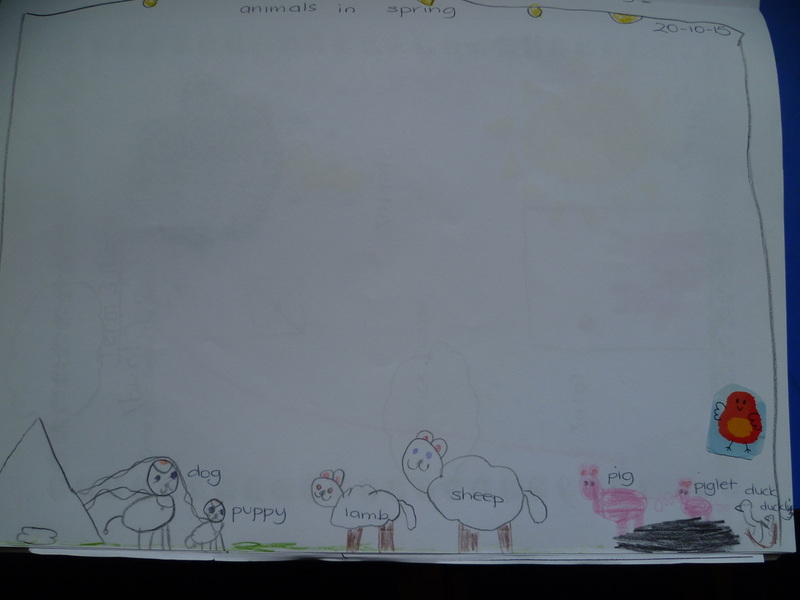 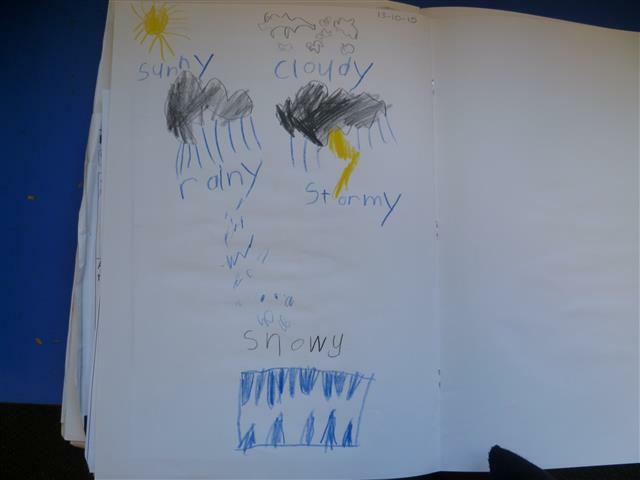 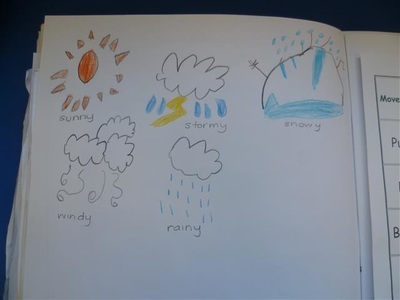 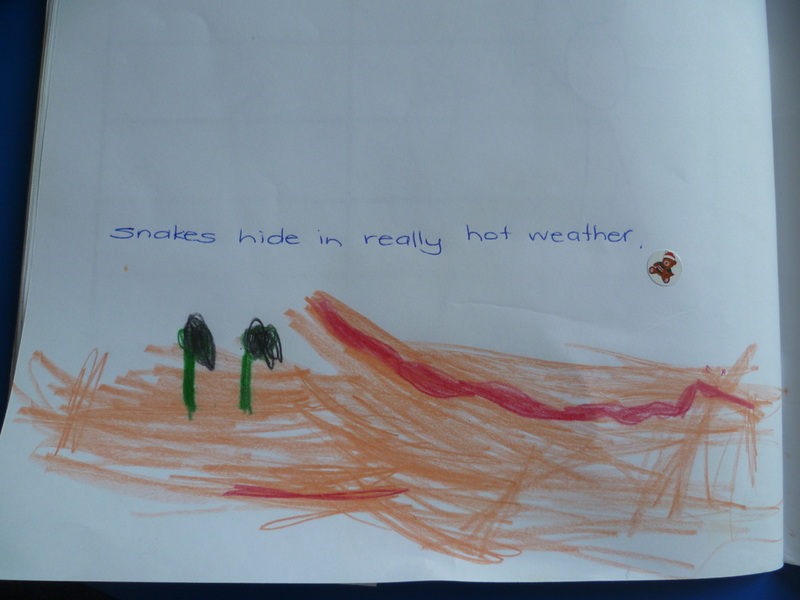 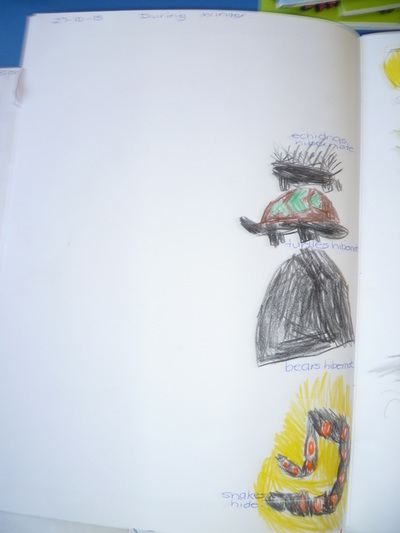 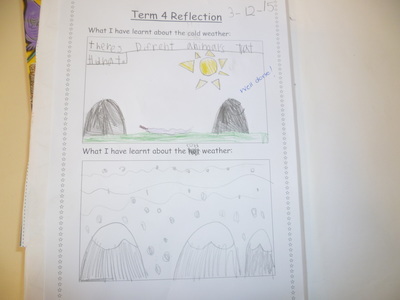 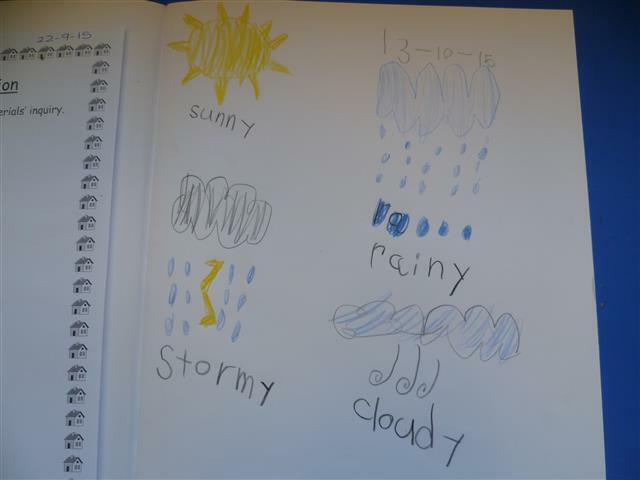 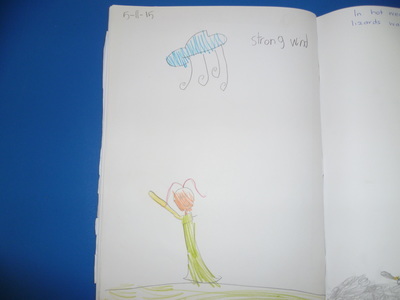 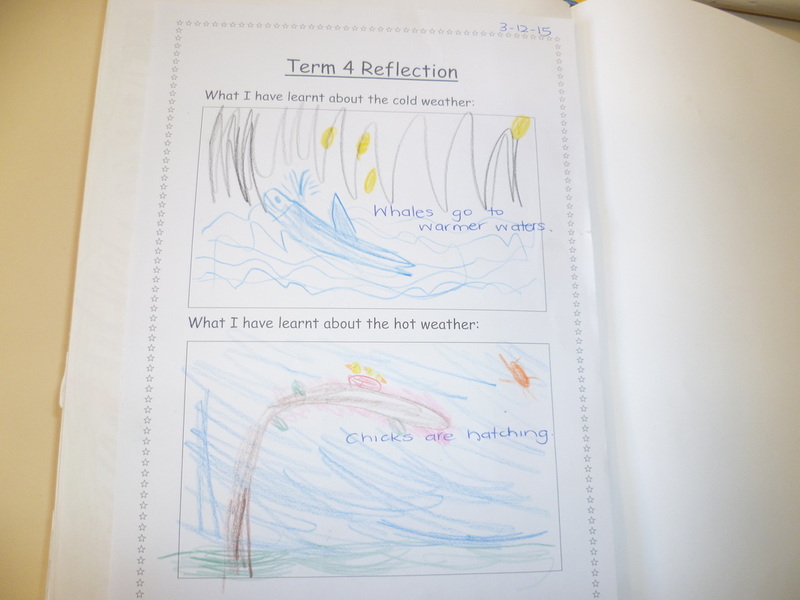 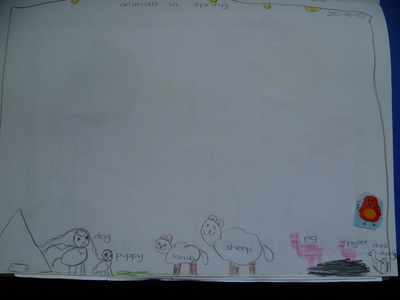 Week 9: The students reflected on their term's learning and drew something they learnt about cold and hot weather.